Bolf Ramshield for Adjacent minions. -1 mana -1 health, epic. Bolf's biggest problem was that face damage killed him. This is actually pretty interesting. 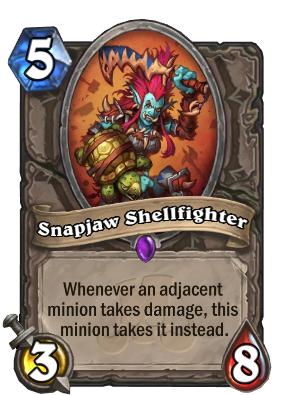 Not sure it will be played (taunt essentially does the same thing in most instances), but it's a neat utility card. So this can tank a flamestrike. Interesting. Taunts ? Taunt druid or warrior maybe ? What happens if I have two Shellfighters side by side? They won't shift the same damage back and forth forever, will they? What do you play this in? I presume that even though this takes the damage, the adjacent minions deal the damage. It can be used to protect a valuable taunt minion(s), while forcing the opponent to attack in to the taunt minion. But unless there's some creative use that someone thinks of, I don't think this will see much play. Maybe put this in death priest? have the spirit of the dead out for the first turn and then position this so it's alone next to the spirit. When this dies the spirit puts it back in the deck, you can redraw it, and you're playing 3/8's for 1 mana that protect the 1 mana 3/8 generator. You play this in a deck full of "kill-me-now-or-else" minions (that preferably have some decent Attack). Imagine this protecting a Gadgetzan Auctioneer or an Oondasta or a Linecracker. If this thing can tank a board clear ( I'm not sure if that's how it'll work) then it could actually be decent in a midrange deck. Stubborn Gastropod defended by Snapjaw Shellfighter. Possible board clear. I don't know if it's good, but I think it'll find a niche. It's anti aoe applications are kind of interesting.